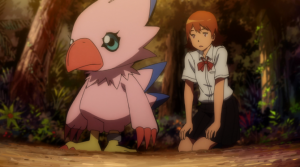 Digimon Adventure Tri: Loss is the fourth in a series of six feature length movies. After the “reboot” and Meicoomon’s rampage, Tai and friends arrive in the Digital World. They reunite with their partner Digimon, who have lost all their memories. As everyone discusses what they should do from here in the Digital World, Meicoomon suddenly appears and then disappears. She still has her memories for some reason as she wanders around, looking for Meiko. Meanwhile in the real world, Nishijima receives word that Himekawa has gone missing. As he investigates, he determines that there’s been some hidden agenda behind her behavior up to this point. 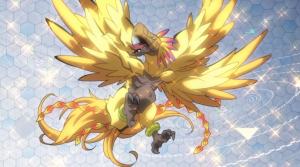 It has something to do with an event in the past that determined both their destinies… Special Features: “The Evolution So Far” – Star Joshua Seth Catches Us Up To The Events Of Digimon Adventure tri. 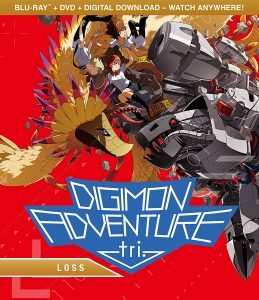 : Loss Digimon Adventure tri: Loss is the sequel to Digimon Adventure tri: Confession. KIDS FIRST! 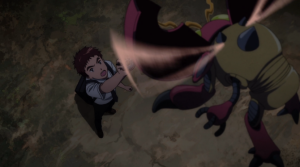 Film Critic Arjun N. comments, “Digimon Adventure Tri Loss entertained me because of its wonderful animation and impressive voice acting. This is sure to be a watch for Digimon and anime fans.” See his full review below. 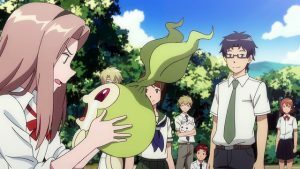 Digimon Adventure Tri Loss entertained me because of its wonderful animation and impressive voice acting. This is sure to be a watch for Digimon and anime fans. The story follows the events after the reboot where all Digimon were forced to forget their partners. In wake of this, the shrewd Joe Kido (Robbie Daymond) sets out t o hunt them while they are at their weakest. To defend, the team must unite and strengthen their Digimon to match up to Kido’s wits. During this, a hopeless Sora (Colleen O’Shaugnessey) tries to reunite with her estranged Biyomon (Cherami Leigh) as Kido targets her first. Colleen O’Shaugnessey, as Sora, excellently presents her sorrow and selflessness for Biyomon. However, their sullen interactions become rather repetitive and forced as the story progresses. Miho Arakawa, as Meiko, splendidly portrays her reformation from saving Mei coomon, using this hope to brighten Sora. Robbie Daymond, as Joe Kido, is my favorite character due to his clever performance full of charisma as he proves to be a force to be reckoned with. Also, his deceiving escapes add a theatric grandeur to the character. Tom Fahn, as Agumon, exhibits his leadership through his care and demands of the other Digimon. Cherami Leigh, as Biyomon, depicts an equally well acted counterpart to Sora with her inability to pair with her. Kate Higgons, as Meicoomon, spectacularly reforms from being the main antagonist of the last movie to one that is heroic following the reboot. The direction by Keitaro Motonaro wonderfully adapts with a similar approach to the source magna. My favorite scene is the resolution between Sora and Biyomon with its conclusion adding a touching end to this mixed bag of a plot. 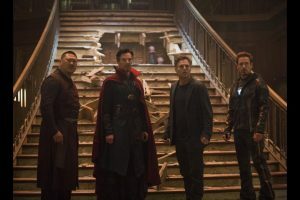 My only problems with this movie are in its inconsistent writing which switches from one tone to the next or even underplays many character arcs. Also, the amount of farcical humor could have taken a break to service the plot’s serious developments. 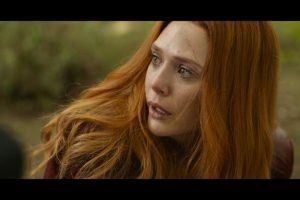 The message of the movie is to always take care of yourself first before concerning others. Sora’s insecurities increase while trying to reconcile with Biyomon but this leaves her and other team members susceptible to attack. I give this film 3.5 out of 5 stars and recommend it for ages 7 to 18 because of its frequent action. The movie is available now on DVD and Blu-Ray, so check it out. 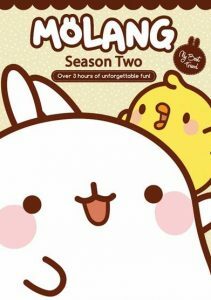 Join Molang, a round, fluffy, and happy rabbit, and his friend, Piu Piu, a poised, timid, and reserved yellow chick, as they explore everyday life. Despite their many differences, Molang and Piu Piu enjoy a special friendship. They have amazing times together ranging from the ordinary to the extraordinary. 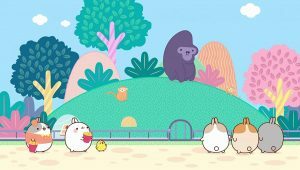 From finding themselves in the middle of the jungle, going to the circus or enjoying a rainy day, Molang and Piu Piu embrace every daily adventure together. Who knew dancing in the rain with your best friend could be so much fun? No matter what happens, every single moment with these two is filled with sheer happiness. 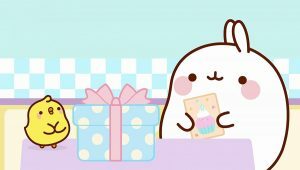 Embark on 52 lovable adventures with Molang and Piu Piu! KIDS FIRST! Film Critic Sahiba K. comments, “The adorable, warm-hearted duo of Molang and Piu Piu are back in Molang Season 2 directed by Marie-Caroline Villand and Stephanie Miziak! The writers compose plots that are incredibly simple, yet engaging and expressive.” KIDS FIRST! Adult Juror Kimberly M. adds, “The show demonstrates positive social skills such as how to get along with others. Themes covered in all the shows include happiness, friendship, caring and respect. I thoroughly enjoyed it and found it quite appealing and engaging.” See their full reviews below. 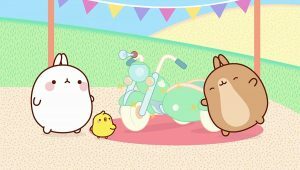 The adorable, warm-hearted duo of Molang and Piu Piu are back in Molang Season 2 directed by Marie-Caroline Villand and Stephanie Miziak! The writers compose plots that are incredibly simple, yet engaging and expressive. 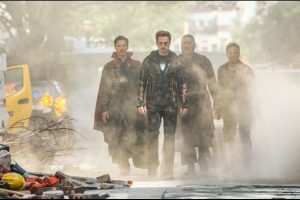 The directors are skilled in easily conveying the plot, jokes and emotion without the use of dialogue. These stories take Molang and Piu P iu on adventures near and far, as they help others and bring joy to the lives of everyone they touch. They often run into a friend or neighbor who could use a helping hand or a mood boost. 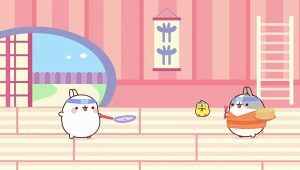 Molang and Piu Piu find unique solutions to everyday experiences and make many friends along the way. The lexicon of Molang and Piu Piu is incomprehensible, so the animation, sound effects and music work together to transcend words. The animation uses simple images to convey the characters’ ideas and concepts. For example, when Piu Piu or Molang have a solution to a complication, a thought bubble pops up to show it in a quick image. 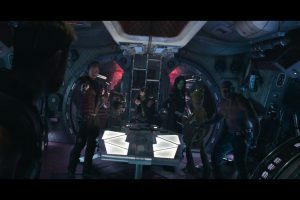 The sound effects are either bright or dark, based on the mood of the scene. For example, when Piu Piu gets stressed, which is quite often, he screeches in distress. Furthermore the music, composed by Nicholas Varley, is very adventurous and upbeat, especially during the traveling scenes. It is lively and adds all the more to the jovial ambience. The art of the anim ation is pure and simple, yet gives a relaxed and easy going aura. The colors are soft, not too bright or too dark, making the visuals sweet and appealing. Many of the objects such as the houses, characters, trees, vehicles and hills are all rounded creating the huggable, lovable world of Molang. For me, the most app ealing part is the happiness that surrounds each and every episode. 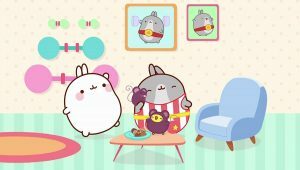 Piu Piu and Molang are inseparable and their friendship is beautifully strong. This foundation sets the mood of each episode and their kindness reaches out to my heart. The message of Molang Season 2 is to brighten the days of those around you and to help those in need. I give this DVD 5 out of 5 stars and recommend it for ages 2 to 10. 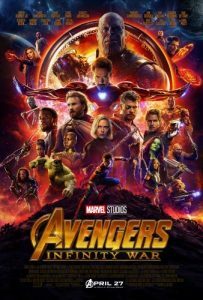 It is available on DVD now so, be sure to check it out. This charming DVD takes you from point A to point B quickly in a manner appropriate for the target age. There is no language spoken except an alien language spoken by visitors. 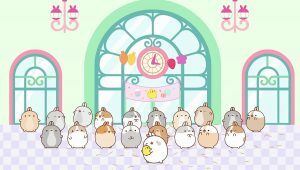 We follow a day in the lives of Molang and Piu, Piu and how they get along on Earty. 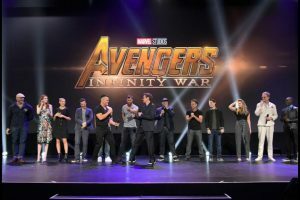 The show is filled with bright colors along with characters and images that are drawn big and simple. This is an animated series with 52 five-minute adventures. The menu allows one to select a specific episode. You can also select different languages. The show demonstrates positive social skills such as how to get along with others. Themes covered in all the shows include happiness, friendship, caring and respect. I thoroughly enjoyed it and found it quite appealing and engaging. I highly recommend this for ages 1 to 5 and give it 4.5 out of 5 stars. Meet Pocoyo, the unforgettable little boy with a very big personality! Your child will learn through laughter with Pocoyo and all his friends Elly, Pato, Loula and Sleepy Bird! Complete your first season with this second volume of 26 episodes! Join Elly as she is stricken with a case of the Elly Spots, and Pato and Pocoyo must give up their picnic in order to help look after her. Then our friends are playing with a model airplane which shoots off into space. 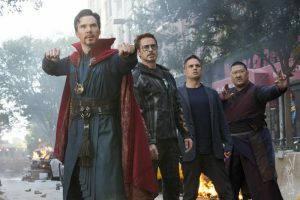 This calls for an adventure to go retrieve it and the gang meets some aliens along the way! From surprise parties to superhero days, every day is an adventure with Pocoyo and friends! KIDS FIRST! 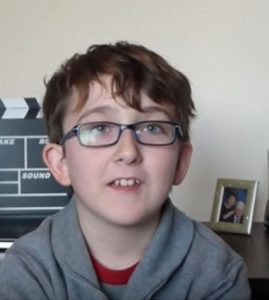 Film Critic Rohan F. comments, “I really enjoy how the whole show is shot in first person, from the perspective of the narrator. This makes the viewer feel very involved in Pocoyo’s world. Each episode has a good moral such as sharing, being kind, cleaning up after yourself and not taking other people’s things without permission.” KIDS FIRST! Adult Juror, Rachael V. adds, This whole series focuses on getting through strange or difficult situations via laughter. It really emphasizes the importance of taking a minute to collect your thoughts and laugh away the negativity. I truly love that.” See their complete reviews below. 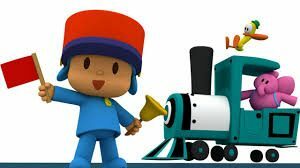 Pocoyo is a unique show for kids. It has cool, clay-like characters and takes place in an entirely empty world. The bright, colorful characters stand out against the plain, white background. The animation style is very clear and calming which fits the personalities of the characters quite well. I like the decision to use very normal toys such as trains and blocks along with unusual characters. It creates a nice contrast. This is a DVD set with 50 episodes. 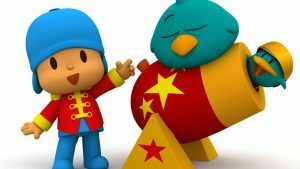 Each epi sode follows Pocoyo and his friends Elly, Pato, Loula, Baby Bird, Sleepy Bird and Caterpillar who find something or make something new and then, they all use the item. I like how many possibilities this format provides. My favorite episode is Guess What? 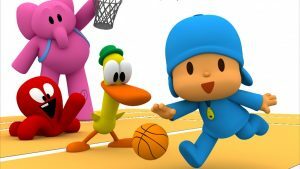 In this episode, Pocoyo and his friends play a game with the narrator. 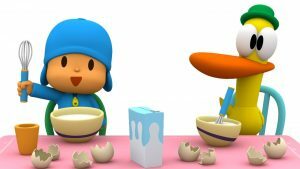 In the game, Pocoyo makes a shape with the things around him. Then, the narrator must guess what the object is. Another episode I really like is Mr. Big Duck. In this episode, Pato finds a pair of sunglasses. 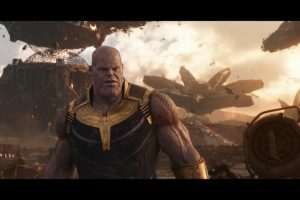 The narrator says they make him look like an adult, so he refuses to play with his friends because they’re too childish. Eventually, they convince him that being a kid is more fun, so he plays with them. This episode is really funny. 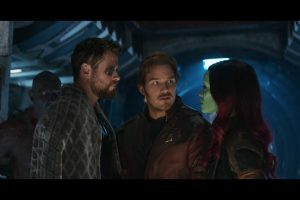 I like how his friends react. I really enjoy how the whole show is shot in first person, from the perspective of the narrator. This makes the viewer feel very involved in Pocoyo’s world. 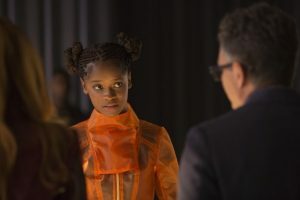 The show is very repetitive, which is perfect for its target audience. I really like how the characters move. They move their limbs as if they are actually made of clay. They stretch and move in impossible ways and it’s very cute and hilarious. Each episode has a good moral such as sharin g, being kind, cleaning up after yourself and not taking other people’s things without permission. The music also fits the show quite well. It sounds fun and almost as if it is being played by a child. 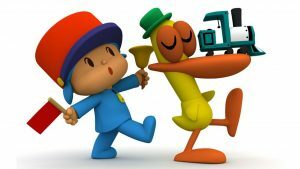 I really like Pocoyo’s voice. It really fits his character, even though he doesn’t speak much. I give this DVD 4 out of 5 stars and recommend it to kids ages 2 through 7. Pocoyo is a funny, kind-hearted toddler with charisma that goes on for days! He has many friends that he goes on adventures with, but my son (2 years old) really loves Sleepy Bird. Sleepy Bird is a cute little bird that is seemingly always asleep and even flies with her eyes closed. My son giggles his little heart out whenever she comes on the screen. Watching Pocoyo interact with his friends is great. They are all so kind to each other. This whole series focuses on getting through strange or difficult situations via laughter. It really emphasizes the importance of taking a minute to collect your thoughts and laugh away the negativity. I truly love that. It’s such a wonderful thing to teach a child. The show’s animation is computer generated with a very straightforward design. 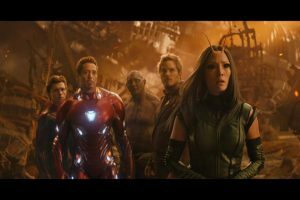 The simplicity of the characters and sets are eye catching, yet don’t over-stimulate the viewer or take attention away from the stories. The music is cheerful and enjoyable. I recommend this DVD for ages 2 to 5 and it 5 out of 5 stars. 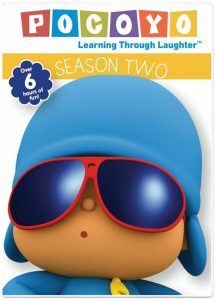 Posted in DVDs Released | Comments Off on Pocoyo: Season 2 – We love Pocoyo. He’s a unique, funny, kind-hearted toddler with charisma that goes on for days! 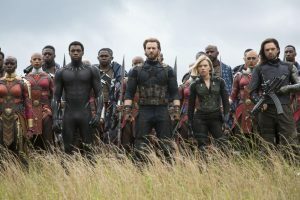 Posted in Feature Film Reviews | Comments Off on ​​Avengers: Infinity War – Truly Worth the Hype! 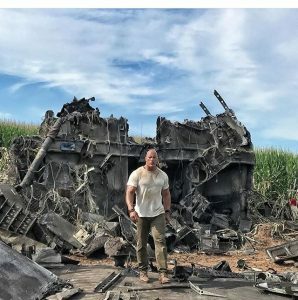 This will Blow Your Mind! I re commend this film for ages 13 to 18 due to suggestive content, language and violence. 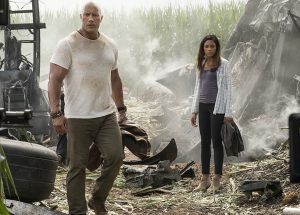 Rampage is more violent than average blockbuster and, there are a few scenes that I had a hard time watching. 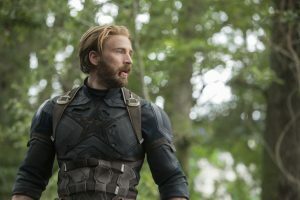 If you are a fan of the arcade game, be sure to look out for some Easter eggs that tie the film back to its source material. 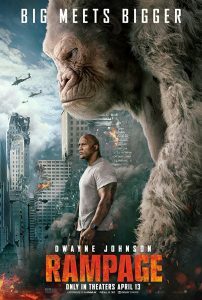 Posted in Feature Film Reviews | Comments Off on Rampage – What it lacks in complexity, it makes up for in pure spectacle and fun!